Working in close collaboration, our organizations are tackling the problem of hidden hunger. We are improving the intake of key vitamins and minerals in the diet through food fortification. The charity evaluator GiveWell and Peter Singer’s charity The Life You Can Save have underscored the critical importance of micronutrient deficiencies and the impact of food fortification by recommending our four groups as standout charities: Food Fortification Initiative , Global Alliance for Improved Nutrition (GAIN) , Iodine Global Network (IGN), and Project Healthy Children (or Sanku). As a group of like-minded organizations, we are guided by a common aspiration: a world where all people have access to the nutrition required to reach their full potential. Each organization provides its own unique set of skills and proficiencies to strengthen national food fortification programs, combining complementary expertise to achieve our shared vision – through collective action. Each organization targets hidden hunger with a proven solution: food fortification, which provides essential vitamins and minerals through the food we already eat. Together, we bring the complementary and collective expertise to achieve our shared vision – through collective action. So why is hidden hunger important, why is food fortification the solution, and why right now? Hidden hunger is a form of malnutrition caused by a lack of vitamins and minerals in the diet such as vitamin A, iron, zinc, folic acid, and iodine. Because we need these essential nutrients in small amounts, they are called micronutrients. Micronutrient deficiencies are the leading cause of intellectual disability in children, preventable blindness in children, and maternal death during childbirth. They can limit a person’s ability to learn, earn a living, or live a healthy life. These debilitating consequences damage whole communities, as well as economies. Our bodies only need small – micro – amounts of these nutrients, but without enough, they cannot function healthily, support growth, or fight off illness. Hidden hunger does not necessarily lead to ‘visible’ clinical symptoms, and so it can be more difficult to garner attention, investment, or action to solve it. Today, close to 2 billion people suffer from a lack of vitamins and/or minerals in their diet, and up to 2.8 million deaths annually are attributable to iron, vitamin A, or zinc deficiency, according to estimates from the World Health Organization, UNICEF, and IGN. Food fortification adds minerals and vitamins to the staple foods and condiments we already eat. It is a proven, cost-effective, and sustainable way to increase the supply of these nutrients in the diet and has been practiced in many countries for decades. At very little cost, micronutrients can be added to staple foods such as rice, oil, and wheat or maize flour, as well as condiments, such as salt. This approach is particularly helpful since it reaches entire populations and leads to dramatic improvements in micronutrient intake and the prevention of deficiency. Although the implementation of large-scale fortification programs is improving, it doesn’t yet reach all segments of populations in all countries and often leaves vulnerable those who are most in need, including rural and remote families or those with limited financial resources, so more needs to be done. Food fortification is an inexpensive intervention with far-reaching impacts on human capital and economic prosperity. Improving nutrition has a ripple effect on education, poverty, and equality. Food fortification is among the most cost-effective global development investments, with a cost benefit ratio of roughly 1:30 for salt iodization and 1:8 for iron fortification according to the Copenhagen Consensus . As part of broad national programs to reduce chronic undernutrition, fortification can save national economies an estimated 2-3 percent of gross domestic product. While many countries already benefit from mandatory fortification of staple foods and condiments, much work is needed to ensure the impact and sustainability of these programs and to achieve equitable access for harder-to-reach and more vulnerable populations. In short, to reach the 2 billion still at risk. Fundamentally, preventing micronutrient malnutrition takes a village. Governments create and enforce policy, scientists advise technical protocol, food industries carry out the fortification, United Nations entities champion and oversee global commitment and progress, donors support implementation costs, and non-governmental organizations catalyze change and bring together stakeholders. Catalyzing those programs also requires a broad breadth of expertise across advocacy, awareness and demand creation, policy, implementation, and monitoring and evaluation to ensure effectiveness. 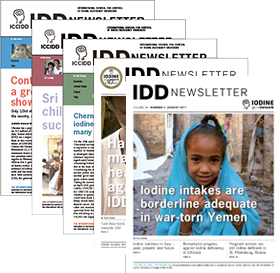 The Iodine Global Network (IGN) catalyzes global collective action to eliminate iodine deficiency, the leading cause of preventable brain damage in newborns. IGN’s core mandate is to facilitate collaboration between stakeholders in Governments, the salt industry, development, and research, to improve iodine nutrition in all countries throughout the world. With its partners, IGN has committed to eliminate iodine deficiency and achieve optimal iodine intake in all countries by the end of 2020. The Food Fortification Initiative (FFI) helps country leaders promote, plan, implement, and monitor fortification of industrially milled wheat flour, maize flour, and rice. These grains are most commonly fortified with a combination of nutrients such as iron to prevent anemia from nutritional deficiencies and folic acid to reduce the risk of brain and spine birth defects. Sanku-Project Healthy Children addresses a critical gap in fortification by providing the incentives, tools, training and support to small-scale African millers to produce fortified flour sustainably for the people who need it most. Already reaching over a million people across Tanzania, Rwanda, Kenya, Mozambique, and Malawi, Sanku-PHC’s goal is to reach 100 million at-risk people by 2025. The Global Alliance for Improved Nutrition (GAIN) advances nutrition outcomes by improving the consumption of nutritious and safe food for all people, especially those most vulnerable to malnutrition with a goal to reach 1 billion people by 2022. In addition to food fortification, GAIN works on appropriate diets for women and young children, workplace nutrition initiatives, supporting SMEs deliver nutritious foods, reduction of post-harvest losses, promoting healthy food choices among adolescents and improvements to food systems, resulting in more diverse and healthier diets. Our respective mandates address critical and complementary areas to achieve that vision and to eliminate malnutrition due to micronutrient deficiencies. IGN’s role convening diverse key stakeholders, FFI’s national leadership and program engagement, PHC / SANKU’s innovations in reaching hard-to-reach populations, and GAIN’s role in broader nutrition programs will each be critical as we move to integrate food fortification into the global nutrition agenda. The food fortification community agrees that the next steps are scaling up and strengthening national efforts to sustain fortification programs. When we pool our skills and resources, we have the insight and collective influence to dismantle barriers, garner political will, catalyze stakeholder commitment, and secure investment to reach the next stage in eliminating hidden hunger. There is no reason that together we cannot achieve a smarter, stronger, healthier global future – a fortified future. Executive Director of the IGN since April 2015, Jonathan Gorstein has been working to support the design and implementation of large-scale nutrition programs, including USI, in developing countries for over 25 years. He is currently a Clinical Associate Professor in the Department of Global Health at the University of Washington, Seattle. Felix Brooks-Church is Cofounder and CEO, Sanku-Project Healthy Children. Felix leads the overall organizational development, mission, and trajectory of Sanku-PHC. He has spent 8 years specifically focused on sustainable solutions for small-scale fortification, and led all aspects of product development and engineering for the Sanku Dosifier technology. The Mulago Foundation has selected Felix as a Rainer Arnhold Fellow. Laura Rowe is Deputy Director, Food Fortification Initiative. She has been working to support the design and implementation of national food fortification programs for the past 10 years with a particular focus on regulatory monitoring. Currently, as Deputy Director for FFI, she supports organizational development and manages technical support for activities throughout the African continent. Penjani Mkambula is Global Program Lead, Food Fortification at the Global Alliance for Improved Nutrition. He manages the provision of technical assistance for food fortification to GAIN’s country programs and other partners. His portfolio spans across public-private partnerships, food fortification, food safety, and supply chain management. He serves on the Board of FFI and the Steering Committee of the Partnership for Aflatoxin Control in Africa.